While on assignment for PGA Tour Radio, it is customary to check out the best local joints in the city the tournament happens to be in. 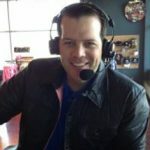 This week, I’m in Dublin, Ohio for The Memorial at Jack’s Place, Muirfield village. It’s an absolute gorgeous property that I look (hope) forward to playing someday. Dublin is a suburb of Columbus, a city I have been to several times for NHL games and vacation to visit family. It reminds me a lot of Buffalo, just a little more spread out. I know a few good spots, other than chains, to dine at, but it was suggested we go to The Thurman Cafe. I thought the exact same thing you did, it’s named after Thurman Thomas. Nope. It’s on Thurman street, and like the HOF Buffalo Bill, it’s great. The Thurman Cafe is a dive through and through. No reservations, usually long waits (just 20 minutes due to storms), and a reputation for the best pub grub around. The Burgers are the big draw, and that is literal. They are HUGE. I tweeted a portion of the menu to Thurman Thomas asking him if he could finish his namesake (nickname anyway), and he obliged. I know I could not. I wasn’t even going to attempt it. A table near us did, and it was massive. Instead, I ordered the Western burger and found a way to finish the colossal 3/4 pound monster. A heroic effort, taking one for the team. A move I’m sure to regret later today, but hopefully I’ll walk it off (not likely). 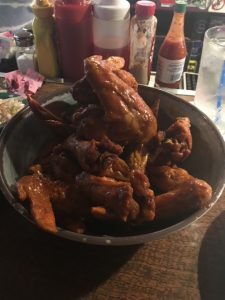 My colleague from Alabama ordered wings, and I should have taken a picture. His order of a dozen wings, come out as a dozen chicken wings, not wings. The whole chicken wing! Come on Columbus! That’s not how you serve wings, legendary joint or not. Despite that faux pas, The Thurman Cafe is a must stop joint if you’re in the mood for a great burger and experience. 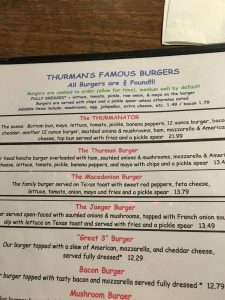 Oh, the owner does know who Thurman Thomas is, and was impressed that Thurman thinks he could finish.